Adjustable card racks. Wire divider easily attaches to the rack to increase the number of pockets. 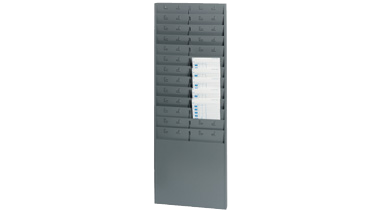 6 deep racks for longer time cards, tickets or forms, comes with one wire divider. Contains a minimum of 20% post-consumer recycled material. Grey. 13-5/8W x 2D x 30H. 12 or 24 pockets.